You can access the shift definitions from the Scheduler tab within the 'Manage Shifts' option. Here you can manage all your shifts. Shifts: An unlimited number of shifts can be defined for a location. A given schedule cannot contain more than 64 unique shifts. 1. Shift Name: Each shift name can be up to 13 characters in length. A shift name can be up to thirteen characters in length, with all letters keeping the letter case assigned by you. 2. Short Name: The 'Short Name' allows you to decide which 10 letter abbreviation to use for each shift. Due to space limitations, only 10 letters of a shift name can be printed using this option. The 'Short Name' allows you to decide what should be printed in this space. For example, if you have shifts named MainER-Day and Clinic-Day, you could enter shortened versions such as ERDay and ClDay in the Short Name area.The 'Short Name' is also used for the calendar feed, so that their display requires the minimum space possible when displayed on your personal calendar. 3. Site: If you selected a separate site within the 'Shift' window the shift is added to the site. It displays the abbreviation for the site that you selected for each site within the 'Manage Shifts' screen. (If you did not divide your current scheduling location into separate sites you will not see this drop down menu displayed.) Each shift needs to be assigned to the site where it should be printed. 4. Start: Select the start time from drop down menu. You can choose a 12 hour or 24 hour selection from the 'Time format' within the 'Profile'. 5. End: Select the end time from the drop down menu. You can choose a 12 hour or 24 hour selection from the 'Time format' within the 'Profile'. A 9:00 a.m. to 5:00 p.m. shift would have a start time of 09:00, and an end time of 17:00, entered in 24 hour format. The times entered here will be used to calculate the initial value used in the 'Duration' for the shift, and to automatically create a 'Schedule Key'. All times are rounded to the nearest fifteen minutes (1/4 of an hour). The automatically created 'Formatted Schedule Key' will reflect the entered values, but can be edited as needed. An entry of 24:00 as the starting time for a shift indicate that the shift starts at midnight at the end of the day on which it is scheduled. This time is exported to other calendar programs as 23:59, correctly showing the shift as starting at the end of the day. An entry of 00:00 as the starting time for a shift indicates that the shift starts at the beginning of the day on which it is scheduled. 6. Duration: A 9:00 a.m. to 5:00 p.m. shift would be 8 hours in length, automatically calculated to the nearest Â½ hour from the 'Start' and 'End' times values. The 'Duration' values are used when calculating summaries of hours worked. For each shift, a value for the number of hours that a provider working the shift should be credited for working. The shift duration may be any value from zero to fifty hours. The 'Duration' values are used when calculating summaries of hours worked. Example: You have created a schedule using a Night shift that is eight hours in duration. Suppose you change your schedule so that your Night shift increases from 8 to 10 hours in duration. If you simply change the length of shift Night from 8 to 10 hours, this change affects all previously schedules that used the Night shift even if they were scheduled when the length of the Night shift was only 8 hours. This may be acceptable if you have no use for your old schedules, but if you use the summary to calculate (for example the total hours worked in a year for each provider) the result would not be accurate. A better way to modify your schedule for the longer night shift is to create a new night shift, such as Night10, with a 10 hour length, updating the shift by using the 'Add Shift' button. When working a schedule, providers will sometimes work different hours from the normally scheduled hours of a shift (for example, leaving late from a busy shift). Providers can edit their shift Start and End times from the entered values to match their actual worked hours. ByteBloc uses the shift Start and End times as confirmed by the provider to calculate the number of hours credited for working that shift. This determines the values displayed and when printing a summary from the Hours report within the Reports section. 7.Call or Backup shift: Backup and Call are special names. A 'YES' or a 'NO' will be displayed within this column. 8. Weekend shift: If a provider works a particular shift on a Friday, Saturday or Sunday, should he or she be credited with working a weekend shift? Many emergency provider groups keep separate track of the number of weekend shifts worked by each provider and attempt to distribute them equitably. 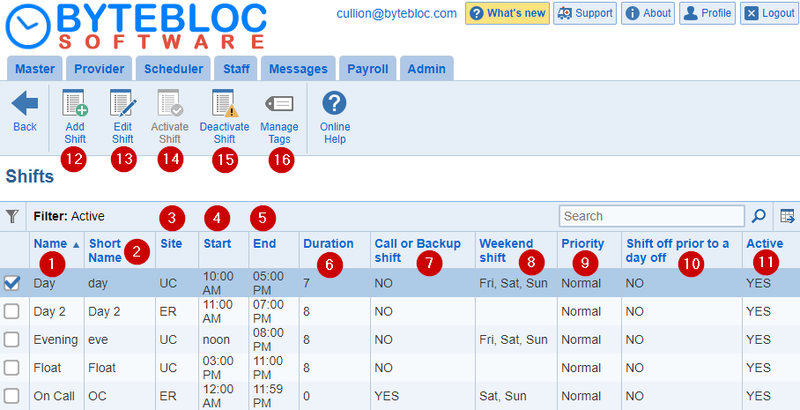 You can keep separate weekend statistics and automatically balance weekend shift scheduling. To do so it needs to know which shifts to include as weekend shifts. For example, some physician groups consider all shifts worked on Saturday and Sunday as weekend shifts. Others might include night shifts or evening shifts worked on Fridays as weekend shifts, but might not consider Sunday night shifts as weekend shifts. As a 'best guess', initially regards all shifts that start on Saturday and Sunday, but not shifts starting on Friday, as being weekend shifts. To add the shifts to your schedule, mark the check boxes in the Weekend if on Friday, Weekend if on Saturday, and Weekend if on Sunday, to indicate which shifts on Friday, Saturday and Sundays are counted as weekend shifts for your schedule. 9. Priority: Rank shifts by their scheduling importance. The Priority of shifts can be entered as 'High', 'Normal', and 'Low'. Note: The Priority value assigned to shifts does not affect the order in which the shifts are scheduled. 'Priority' values are only considered when it is not possible to fill all of the shifts in a day (such as when there are six shifts to be filled, but only five providers available to work them). Under these circumstances, 'High Priority' shifts are preferentially scheduled if possible, leaving a 'Normal' or 'Low Priority' shift as the unscheduled shift for the day. Example: A 'High Priority' shift might be a night shift if this is the hardest for you to fill later on a 'volunteer' basis. A 'Low Priority' shift might be a Backup shift, since you would want other shifts filled first before worrying about filling that shift. Other shifts would usually have a 'Normal Priority'. If a provider has requested Off for the entire day (all shifts) on a Wednesday, the provider would usually want to also be Off for the night shift on Tuesday, the preceding day. If the night shift had been marked Yes in the 'Shift off prior to a day off' column, it will automatically mark the provider off for the Tuesday night shift, saving you the trouble of making that entry. You can, of course, override this automated entry if you desire. Usually the 'Shift off prior to a day off' feature is used for night shifts. You do not need to make any entries in the 'Shift off prior to a day off' area; this feature is optional. 11. Active: Determines whether a shift is used and shown in new schedules that you create. If you use the Scheduler over a prolonged period of time, your schedule may change so that you need to add new shifts and stop using older ones. The unused shifts cannot be completely deleted as they may be referenced in older schedules. The Scheduler allows you to customize up to 64 shifts! If the Active text field for a shift is marked by default as 'YES', the shift will appear in new schedules and in all drop down menus where you are selecting shifts. If the 'Active' text field for a shift is marked as 'NO', the shift is 'Inactive' and will NOT appear in new schedules or in most drop down menus where the Scheduler asks you to select shifts. Shifts within the 'Manage Shifts' screen are displayed showing the 'Active' shifts first. You have the ability to filter between 'Active', 'Inactive', and all 'Active' and 'Inactive' shifts together. Click on the filter icon underneath 'Shifts'. Now, a dialog box will display where you can check the 'Active' and 'Inactive' check boxes before clicking the 'Apply' button to make the change. If you click the 'Clear' button, it will clear your results. The 'Inactive' shifts are displayed as grayed out to distinguish the 'Active' shifts. Changing the 'Active' status of a shift (either from 'Active' to 'Inactive', or 'Inactive' to 'Active') may require other changes. You will be notified of any important changes, so be sure to read any messages that are displayed and follow the instructions. 12. Add Shift: Here you can enter in your shift settings by clicking on the 'Add Shift' button. 13. Edit Shift: Modify your shift settings within the 'Shift' window. 14. Activate Shift: Select the shift in question that you want to activate. Now, click the 'Activate Shift' button to continue. The 'Activate shift' dialog box will display. You have the option to choose from 'Activate' and 'preserve all settings' or 'Active' and 'remove all settings'. 15. Deactivate Shift: Select the shift in question that you want to deactivate. Next, click the 'Deactivate Shift' button to make the change. 16. Manage Tags: Define and edit tags that can be applied to shifts. The sort option is available for all headings. Ordering of a shift is first by site, then by start time. The shifts are displayed top to bottom, then left to right. A filtering function can be used to search for 'Active' and 'Inactive' shifts. Once; you click the 'Apply' button it will display the selection you chose. 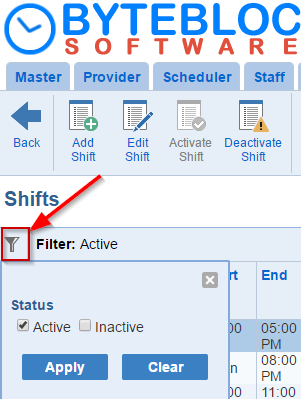 If you are searching for an inactive shift make sure to adjust the filter in left hand corner before you do the search.